ASP.NET AJAX enables a Web application to retrieve data from the server asynchronously and to update portions of the existing page. So these, partial page updates make web application more responsive and hence improves user experience. depending on the link we have clicked. Step 2: Create an ado.net entity data model using table tblStudents. Upon creating the entity model, change the name of the entity to Student. Save changes and build the solution, so that the Student entity class gets compiled. Step 3: Add "Shared" folder (if it doesn't already exists) in "Views" folder. Right click on "Shared" folder and add a partial view, with name = _Student.cshtml. Copy and paste the following code. Please make sure to include MVCDemo.Models namespace. Step 5: Right click on the "Views" folder and add a folder with name = "Home". Right click on the "Home" folder and add a view with Name = "Index". Second parameter : is the name of the action method that needs to be invoked, when the link is cicked. Third parameter : is the ajaxOptions object. Please help me to understand the difference between view and view model..
View is just HTML Representation to the end user. But only one model item can be passed to a view. But in some scenarios you may like to use different models for a single view. In that situation we create a different model in which we include all the required properties form different models. This particular model is called a ViewModel and then we create a view for this newly created Model. Note: View for viewmodel is like normal view only one model object could be passed to it. View will have the user interface controls like button, text box ..where as ViewModel will have the data needed to show on the view. Or ViewModel will have data that will be bound to the View controls. I have problem of loosing the model data when Partial view come back to controller from callback event. so every time I have to get the model from database. what did I wrong here? If you can help he, it would be really helpful. (1). I have MVC project using UNIT/y for get the MODEL as service. i got All, top 3, bottom 3, output at new page. instead i completely followed you and made partial view name of _student. can you tell me another solution. it also happend to me just now. the solution is that your take note of the code you used to install the jquery unobtrusive ajax . Install-Package jQuery.Ajax.Unobtrusive this is wrong. Install-Package Microsoft.jQuery.Unobtrusive.Ajax and this is correct. the difference is that the correct one has Microsoft in it while the wrong one does not. In above code table name is changed through entity design but in my solution it does not reflect...still taking tblStudents. why? please check the action name and may be debug model..
Is asp.net webforms essential for me before learning mvc???? 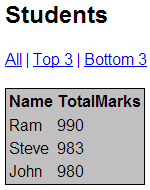 What happens when you click "Top 3" link button and it shows you the top 3 student names and then you click back button on your browser? Please answer as soon as its possible for you. Thanks in advance.